Many dog experts believe that sleeping arrangements are an occasion where humans and dogs should keep their lives separate. That’s not necessarily a popular opinion, though. According to Psychology Today, almost half of all dog owners share their bed with their dog. Where you fall in this great divide is down to you, but you should at least have the opportunity to make an informed decision for yourself. This article will guide you through the pros and cons of sharing your bed with a dog, and the alternatives available to you. 1 Should You Let Your Puppy Sleep in Your Bed With You? 1.1 Does Allowing a Dog to Sleep in Your Bed Cause Separation Anxiety? 1.2 Is Your Dog Sleeping in Your Bed a Sign of Dominance? 1.5 Where Should Your Dog Sleep at Night? Should You Let Your Puppy Sleep in Your Bed With You? So, you’ve brought your new dog home, and you’re keen to bond quickly. They are following you around the house and seems eager not to be left alone when the sun goes down, so you think maybe you’ll just let them sleep with you for the sake of a quiet life. Puppies have a weak bladder and immature brains. That’s a recipe for accidents all over your bed – and if you set a precedent early, you may find yourself asking why your dog is peeing on your bed long into adulthood. Your dog won’t be a puppy forever. The little fluffballs grow up faster than you realize. By the time they reach maturity, a cute Labrador puppy that would lie at your feet has become a hulking beast that takes up the entire bed – leaving no room for you. If you set a precedent to your puppy that they can sleep on the bed, they’ll expect the same treatment when they grow up. Sooner or later, you’re going to have to leave your puppy alone. Why not start with an evening, when you’re still at least in the same house? A dog will need to learn to sleep through the night without waking you up for playtime, walkies or general attention. Instead, start when they’re a puppy when their minds are significantly more pliable. Establishing a nighttime ritual with a new puppy is one of the hardest parts of pooch parenting, and first-time dog owners often don’t realize just how much sleep they can expect to lose in those initial weeks. It’s advisable to stand firm and avoid allowing your pup to share your bed until they reach maturity, however, lest you create a rod for your own back. Does Allowing a Dog to Sleep in Your Bed Cause Separation Anxiety? It doesn’t necessarily cause it, but it will certainly not help if you’re trying to break a dog’s separation anxiety. Spending a night on their own might be an excellent way for your dog to start getting used to being alone for a few hours. They’ll be safe in the knowledge that you’re still in the house as they’ll be able to pick up your scent. We have already discussed how it will set a tricky precedent with a puppy, and the same may also apply to an adult dog. It’s crucial that you remain consistent with your approach to furniture and dogs, so if you’re going to let Fido sleep with you on Monday, you can’t change your mind on Tuesday because he snores and fidgets. This will only get worse if you then decide that you miss him, and invite him back into the bed on Wednesday. 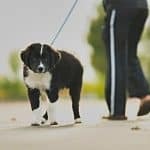 This chopping and changing will eventually lead to insecure attachment, as your dog won’t know where they stand with you and how you may react from one moment to the next. That makes a canine behave more clingily those that have been actively mistreated, as they continuously seek your approval. You can learn more about insecure attachment in this research by PLOS One. There is, however, one alternative viewpoint that you might want to consider. If you don’t get to spend a great deal of time with your dog because you’re at work all day, sleeping together may be a chance to spend some quality time and enhance your bond. It will undoubtedly give your dog something to look forward to while you’re out of the house. Is Your Dog Sleeping in Your Bed a Sign of Dominance? This depends on how much stock you place on the theory of dominance and alpha status, which relates more to wolves and wild dogs than the dog that shares your home. After all, it’s not exactly a secret that your dog rules the roost. Some people would declare that allowing a dog to sleep in your bed alongside you is ceding control and dominance to the animal. The Bark Magazine offers an interesting article that discusses this mentality and how seriously it should be taken, while Dog Breed Info provides a counter-argument for anybody that may feel strongly about ensuring that humans remain top dog. Dominance is only really a problem if your dog displays any behavioral issues, such as aggression toward strangers or attacking other dogs for no reason. In such an instance, allowing your dog to sleep in your bed with you could be considered as sending them a message that you believe them to be equals. If you prefer to keep a strict master-and-canine power dynamic, you should keep your dog off human furniture. In doing so, however, you’ll be denying yourself bonding time with your dog. If you’re interested in sharing your bed with a canine companion, that’s fine – there are benefits to sharing a bed with your dog. There’s the obvious fact that it’s another warm body (seriously, dogs make for amazing organic hot water bottles!) to keep you toasty, but there are a plethora of other reasons why you should share your bed with a pet. It Will Help You Bond with Your Dog. Nothing bonds a human and dog faster than sharing a bed together. Dogs are pack animals, which means that they love bundling together and sleeping in a pile – when a dog sleeps alongside you, it’s cementing your status as part of their park. What’s more, a dog that sleeps with you is also demonstrating complete and utter trust in you. A hound is never more vulnerable than when they’re sleeping, and by doing so with you is a sign that they believe that you’ll look over them. It Reduces Your Stress and Anxiety. 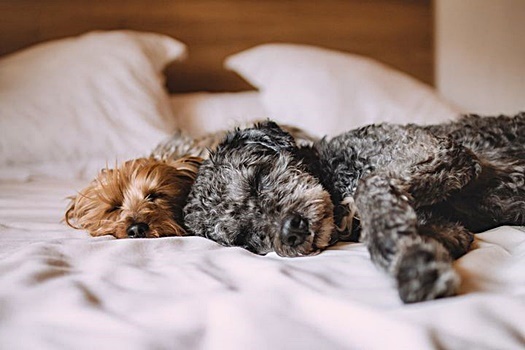 Believe it or not, sharing your bed with your dog can help you get a better night’s sleep – assuming the canine in question isn’t scratching, snoring or squirming all night. Snuggling up to your pet will release oxycontin to your brain, which will help you stay calm and relaxed. This will allow you to drift into a long and peaceful sleep, and wake up feeling great as you feel your stress and anxiety melt away thanks to a cuddle from your four-legged friend. Safety and Security. If you live alone, a dog is a great companion to keep you safe and warn you of any potential intruders to your property. The same goes if you have a pet that is monitoring your bedroom door. This may also be helpful if you live with roommates, or have visitors in your home. It means that you’ll know if anybody is attempting to gain access to your room, and if they’re unwelcome, your little guard dog will soon deter them. Naturally, a canine companion will also ease any loneliness that you may feel if you don’t have anybody else sharing your bed, offering better cuddles than most humans could ever dream of. They’ll Get You Up in the Morning. Not a morning person? You and half the world – people, tend to thrive either first thing in the morning, or later at night. If you’re the latter and loathe the sound of an alarm clock, consider making use of the furry one in your bed. If you can get your pet into a routine of heading out for a pee first thing in the morning, having them in your bed means that you’ll be licking, pawing and generally waking you up as soon as they’re ready. That’ll give you the motivation to kick off those covers and get outside into the bracing morning air for a walkie! Your Dog Will Love it. Look, let’s be honest – you pretty much live to make your pet happy. Well, a surefire way of doing that is to allow Fido to sleep in your bed with you. Your pooch will want to be close to you all the time, and the feeling is hopefully mutual. Nothing will leave your pet feeling happier and more contented than getting to share something as intimate as a long sleep with you, and you’ll share pheromones that will bring joy to the pair of you. As you’ll see, there are many reasons why people may choose to share their bed with their dog – and it can be hugely beneficial for both human and animal. In the interests of providing a thorough comparison, however, we should also review the other side of the coin. As we mentioned at the top of this article, some experts in canine behavior would claim that allowing your dog to sleep with you is a bad move. We’ve already discussed the separation anxiety and dominance theory arguments, and you can make your mind up about whether they apply to you and your pooch. However, here are some other factors that you’ll have to take into consideration before deciding whether your dog is permitted to share your bed. Dogs Snore and Fidget. We mentioned this in the pros section, and we were speaking half in jest there. However, it’s an unavoidable fact of life – dogs won’t necessarily lay still for the duration of the night, as much as you’d like them to. Your pet may disturb your slumber by crawling all over you, deciding to lick themselves clean at midnight, snoring up an ear-piercing storm, or indulge in any number of other disturbances. You’ll notice that we haven’t even mentioned the possibility of flatulence! If you’re going to share your bed with a dog, we hope that you’re not a light sleeper. Parasites – Sharing is Not Caring. Sometimes dogs suffer from infestations of parasites, including fleas, ticks and a variety of worms. If you allow your dog to sleep in your bed, you’re not just inviting the pooch in question. You’re throwing a party for all the bugs and parasites that are hitching a ride upon his or her back. You May Aggravate Any Allergies. It’s probably safe to assume that you’re not allergic to dogs if you bring a pooch into your life and share your home with them. However, dogs will step into, and roll around in, all kinds of things during a typical day. If you have any kind allergies or sensitivities, letting Fido bring these unwelcome foreign items into your bed will not end well for you. 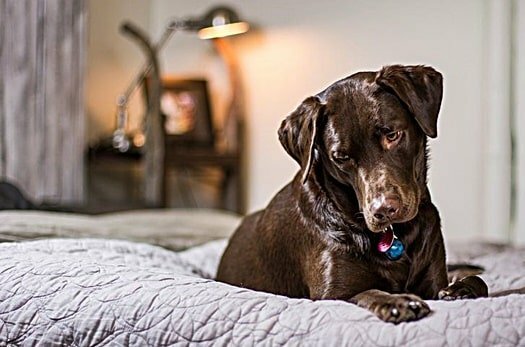 You’ll also have to wash your sheets with more regularity, as not only will these potential allergens be making their presence felt, but you’ll also end up with many muddy paw prints. They’re Watchdogs. We pointed out how a dog standing guard over your room can be a great thing, but it can also have its dark side. If your dog is jittery or takes their responsibilities seriously, they may disturb you constantly by barking, howling and generally alerting you to people moving around outside. If you share a home or even have neighbors that can be heard through the walls or outside, your dog may drive you crazy when you’re trying to sleep. It Can Lead to Aggression. Dominance is not necessarily a problem for most dogs, but aggression can be. 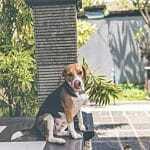 Even the most mild-mannered pooch can become territorial if they spend enough time in the same place, and many dogs consider where they sleep to be their ‘den’ that must be protected. 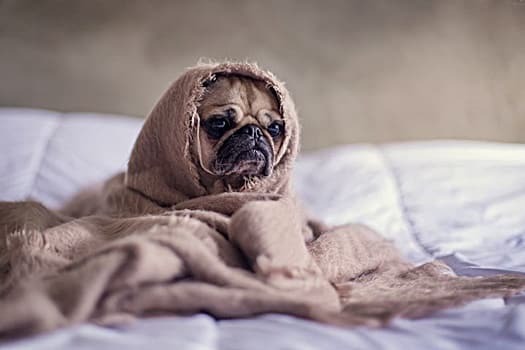 If you won’t want to be growled at every time you climb into bed at the end of a long day because your dog feels that you are invading their territory, it may be an idea not to allow them to get too comfortable there. It Can Cause Marital Difficulties. If you share your bed with another human, you may have to consider the old saying, “two’s company, three’s a crowd.” If your spouse doesn’t want to share a bed with your dog, they may find it incredibly frustrating to be kept away by the pooch, or they may grow weary of having to negotiate a canine obstacle course every time they want to show you some affection. Yes, human intimacy can take a real hit if your dog shares your bed as Fido will want in on any cuddling that takes place in the bedroom. Accidents May Happen. As we have said, puppies are prone to peeing on the bed – but that doesn’t mean that an adult dog will never do so, especially if they are closer to the senior end of the spectrum. It’s not just pee or the world’s least appealing chocolates on your pillow that you have to worry about either – dogs are prone to throwing up, and nobody wants to deal with that in the middle of the night. It’s a Lifetime Commitment. As we mentioned earlier, you can’t change your mind once you have decided to allow your dog to sleep on your bed. If they’ve done so once, they’ll expect to continue doing so every night. Don’t even think about attempting to get Fido back into a crate after he’s had a taste of the good life, as he’ll want to be close to you – no number of blankets and pillows will make that up to him. 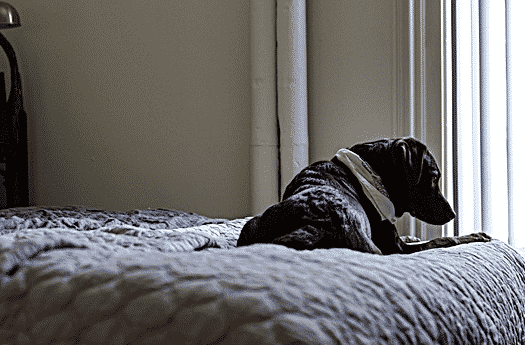 It’s up to you whether any of these facts are enough to deter you from allowing your dog into your bed, or if they’re a risk, you’re prepared to take. The decision, as always, is entirely yours. Just be sure to make it based on your preferences and what is best for the both of you, not what anybody else tells you is appropriate canine conduct. Where Should Your Dog Sleep at Night? So, if you have made your mind up that your dog is not welcome in your bed, where should they be sleeping? Again, this is up to you, but here are some suggestions. A Dog Bed or Crate in the Bedroom. 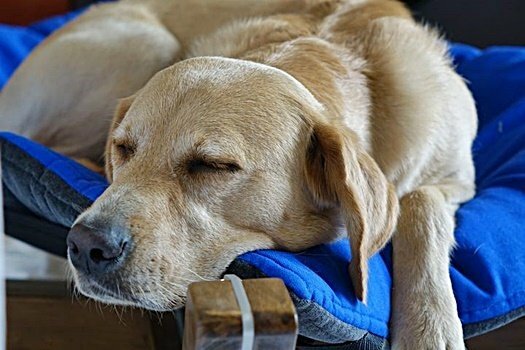 If you set up a specialist dog bed beside your own, your dog may be able to enjoy all the benefits of sleeping in the same room as you without interrupting your sleep. This will also give your dog somewhere comforting to nap during the day, as they’ll be able to find a room with your scent while you’re out of the house. However, be prepared for an opportunistic critter to take advantage of your proximity and to leap onto your bed when you’re asleep. A Dog Bed or Crate in Your Dog’s Bedroom. Have a spare room in the house? Why not assign it to your dog. This will give your dog a safe place to call his or her own where they can eat, drink and sleep. Just make sure there is nothing that could be considered dangerous in the room, as your pet will be spending unsupervised time there. A Dog Bed or Crate in the Kitchen. Kitchens are favorite places for canine beds and crates, mainly because there are plenty of different smells here that will keep your dog amused. However, if your pet has an inquisitive nature, you may need to ensure that they’re in a lockable crate at night, lest they work out how to open the fridge or raid the bins while you’re asleep upstairs. Free Reign of the House. If you allow your dog on every piece of furniture in the house expects the bed, they may grow a little confused. However, if they can snuggle up on the sofa, they may embrace this idea and snooze away in the living room while you’re in bed. The most important thing to bear in mind when you’re looking for somewhere to house a dog is that they have sufficient space to move around, there are no draughts, there is plenty of access to fresh drinking water, and they can create their own kennel or den experience. It’s advisable that you do not let your dog sleep in a child’s bedroom, however; this could make your canine excessively protective of the young person, which will lead to them behaving aggressively toward anybody that approaches them. Yep, even you. Where your dog spends the night is entirely up to you. Whatever arrangement works well for one person may be completely inappropriate for somebody else. The most important thing is that both Fido and yourself manage to get a good, quality night’s rest. Everything else can be worked out among yourselves. Why is My Dog Peeing on the Bed on Purpose? Why Is My Dog Sleeping a Lot More Than Usual?